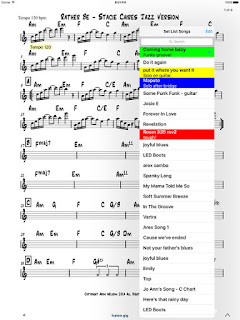 The unrealBook is not always mentioned when listing music readers for iOS, but it was actually one of the first apps designed to use PDF music on stage. Since then the developer has kept focus on the gigging musician and carefully added features, without burdening the app interface with too much useless functionality. First and foremost, unrealBook is a PDF reader. Full stop. It doesn't support any other music file formats, but it does PDFs really good -- including support for bookmarks, table-of-contents and index files. 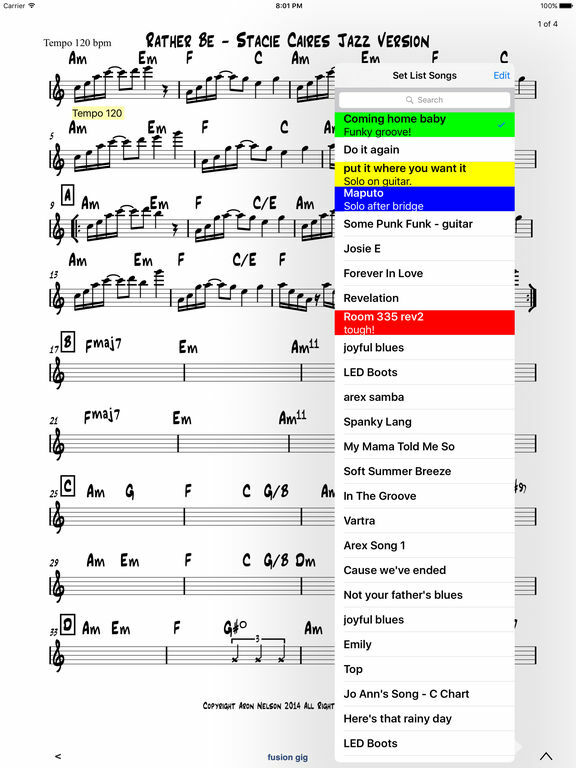 In this regard unrealBook is similar to the Fakebook Pro app in that it allows CSV (comma separated value) files as input to index PDF collections of music. Just be aware that unrealBook does not handle ChordPro or any similar format that allows transposing or simple editing of chords and lyrics. And in this version unrealBook is iPad only; to use it on your iPhone you have to buy a separate (file-compatible) app. But it manages the iPad screen real estate efficiently and really utilizes the power of the iPad Pro, including Apple pencil annotations. The only drawback here is that the landscape two-page viewer is very limited. So, what is a transmogrify button then? This is a button that you can put anywhere on your music page which is customizable to control the metronome, the recorder or player, give a pitch, popup a note or send MIDI. Unique and useful feature! The main problem for unrealBook is that it competes directly with forScore, which is one of the most polished and stable apps on iOS. This means that even if unrealBook is really, really good (and it is), there's little reason to recommend it over forScore if you have an iPad.